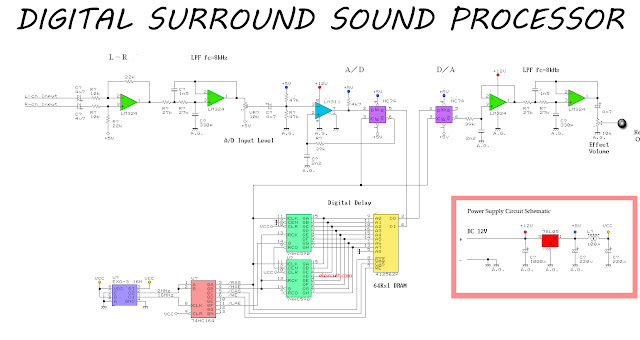 Here is a simple circuit of Surround Sound Processor using the delay in effect. 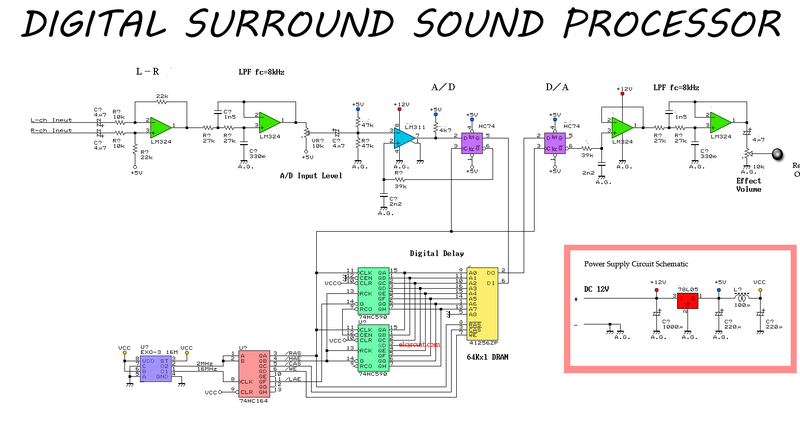 The audio circuit is processed using analog and digital ICs. 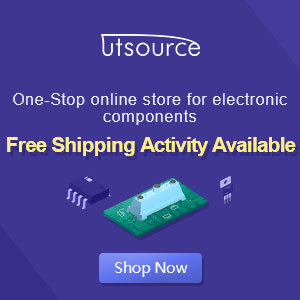 IC include: LM324, LM311, and other you can see at circuit diagram below. This circuit function produces a surround effect with an analog audio signal processing, where there are two inputs (stereo). This simple circuit generates surround sound by separating voice reverberations on the input signal. and mixing the sound from the front channel and make it into rear channel. Typically, voice (vocal or instrument) contained in both channels with the same amplitude and phase. But the reverberations are regular phase between the two channels, and emerged as the difference between the two channels. When removing the same phase came between the two channels in any way, it will be able to separete just echoes.This is easy to do depends on subract R-channel of the L-channel differential amplifier. This method separates the echo, and the difference in addition to the (section highlight, phase error, etc.) as well. This does not have much effect on actual usage. And this effect varies by confditions of signal sources. Sound made in the processing of separated digigtal better than plain voice as a live recording. When building a temporary circuti experiment, you will be able to ascertain the effect of supressing the center and separate sound reverberations. Separate echo applied to delay as refrected voice in the hall. This is a very important process in any surround processor. time delay is tipicaly several ten milliseconds, and this affects the tendency of surround effects. Reverbration amplifire strengthened with power, and output to the rear speakers. In the actual case, the echo reaches the listener from all directions. However, the main speaker at the front plased normaly so that reverberations channel spot behind the listener to create surround effects. thank you dodit, users can bouy it from your products.